V.S. 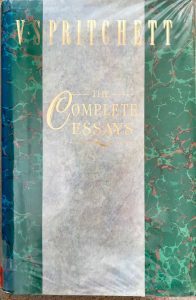 Pritchett, The Complete Essays, Chatto and Windus, London was published in 1991 when the English author was 91 (he died in 1997), and is now out of print. In a single paragraph, without analyzing or interpreting or even commenting on the novels, Pritchett had somehow managed to capture their essence. And he did it not with the skeptical distance of a scholar but with the messy proximity of the fellow practitioner. It has 1300 pages and is, as he suggests, ‘heavy as a cast iron skillet’. The 203 essays, originally mostly book reviews, cover hundreds of writers from Europe, Asia and the Americas– an idiosyncratic, eclectic but loving and perceptive history of western literature. They were highly esteemed by the likes of Edmund Wilson, Elizabeth Hardwick, Anthony Burgess and Susan Sontag. Pritchett discusses earlier writers such as Cervantes, Sterne, Smollett (who I’ve still to read) and Fielding; a large body from 19 and 20C – most of the canonical English novelists, and the less canonical like Gissing, the Grossmiths, Samuel Butler and Jerome K. Jerome; then Conrad, Woolf and co. to Orwell and Rushdie; as Jensen says, VSP was ‘generously receptive to younger talent’. He assesses Americans from Benjamin Franklin, Whitman and Crane to Updike. Poe and Twain are delineated with characteristically controversial broad but telling strokes within the distinctive Puritan tradition of their country. Be careful: if he is drawing his portrait he may be drawing yours. Pritchett admires Brenan’s dislike of ‘critics of poetry who insist on “explicating”’. Maybe because he’s the same; Jensen quotes his biographer describing Pritchett’s quality of ‘undoctrinaire discrimination’ – that fine and sadly now underused term so dear to the great Leavisite tradition of critics (well, maybe not the ‘undoctrinaire’ part) -and the ‘sympathetic and respectful curiosity’ with which he approached characters in literature and in life. He has the ability to get to the essence of a writer’s nature and work and portray it with elegance, wit and intelligence. I’m not sure I always agree with some of his larger generalisations, but I enjoy the stimulating, cheerful conviction with which he makes them and the polished, convivial style in which he expresses them. Gibbon has a taste for the truth that is melancholy, for seeing life as a series of epitaphs. This isn’t just thrown in as a witty epigram: it’s a logical conclusion arising from the intricate argument that preceded it. The piece on the eccentric Thomas Day – its title ‘The Crank’ is apt – is brilliant. Day was the shabby enlightenment rationalist – ‘the modest and entrancing crank of the century’ – who was so convinced of the ‘sufficiency’ of men and the ‘insufficiency of women’ as Pritchett puts it, that he set about to ‘construct his own wife from blue prints in advance’. I’ve written here before about this deluded disciple of Rousseau and his notorious experiment to mould a suitable wife for himself from a child plucked from an orphanage, but this essay says to much more and so much better than I was able to in my post on the ‘Lives of the Obscure’ in Virginia Woolf’s first volume of The Common Reader. There’s a particularly strong representation of major (and lesser) French writers — he almost convinces me to give Anatole France another try. I’ve borrowed this massive book from the library, and must return it soon. I’ll have to buy a copy to read on, one I can annotate. I’ve only had time to read a few of the essays that appealed most, so I’d commend this review by Jensen to get a fuller picture of Pritchett’s tastes and achievements in these essays and in his short stories – which I intend to read now I’ve sampled this collection. I found I had to dip in and read in small bursts, slowly. 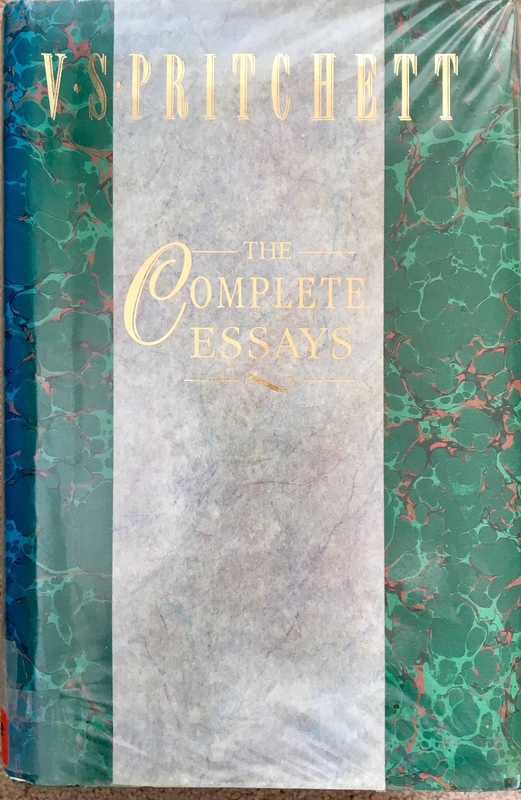 Every sentence and paragraph is so carefully constructed, the arguments and perceptions so cadenced and measured in expression, that every essay needs careful appraisal and rereading. They are to be sipped and savoured, not gulped. they sparkle with impression, metaphor, and aphorism. He goes on to suggest that maybe Pritchett has made less critical impact than Virginia Woolf, another who excelled in fiction and critical essay-writing, because he lacked her ‘fierceness’, her ‘polemical strain’. He was disdainful of what might be called the approach of the professional (ie academic) critics. I suppose he’s what’s usually dismissively categorised as a passionate amateur and aesthete. Nothing wrong with that.